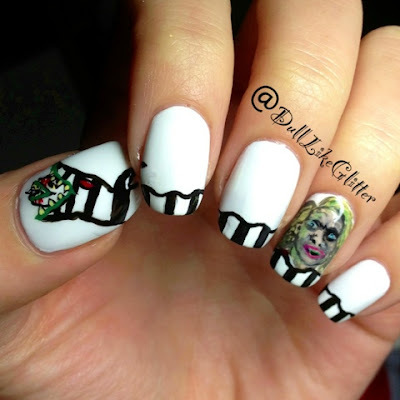 Saving the World One Nail at a Time: Beetlejuice! Beetlejuice! Beetlejuice! I did these for Paper Thin Nails contest. I think I should have stuck more to one style and not mixed realistic with cartoon because they clash a bit but, I still worked very hard on them and thought I should post them! All polish was used for these nails there was no acrylic. The base is Essie Blanc, For Beetlejuice I used Essie Sand Tropez for the skin, China Glaze for the black and to mix shades lighter, Ruby Wing Birdie for the yellow hair with touches of OPI Don't Mess with OPI for the moss green on the side of his face and in his hair, Essie Forever Yummy for the lips, Sally Hansen Shocking Seas for the eyes and Essie Blanc for the white highlights. For the sandworm I used Essie Blanc for the white sections, China Glaze Liquid Leather for the black, Essie Forever Yummy for the red eyes, OPI Don't Mess with OPI for the lips and Ruby Wing Birdie for the yellowing teeth. With vape juices which come from food-grade ingredients, their vaping flavors are amazingly smooth and consistent.